Congressman Kevin Yoder is fighting to keep his seat and fend off rising star in the Kansas Democratic Party Sharice Davids. 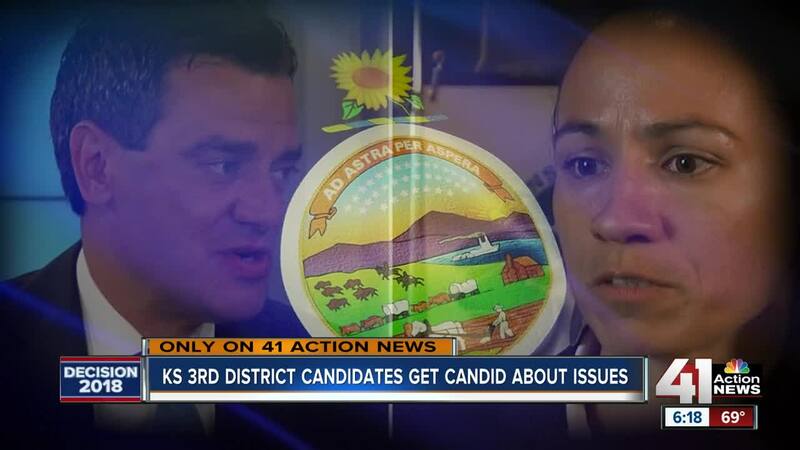 KANSAS CITY, Kan. – Congressman Kevin Yoder is fighting to keep his seat and fend off rising star in the Kansas Democratic Party Sharice Davids. Kevin Yoder’s Third Congressional seat has been challenged multiple times. Each time Yoder has won by double digits. In this midterm election – Yoder’s seat is one of the most at risk to be lost by republicans. During our “Conversation with the Candidates,” we talked with Rep. Yoder at Gates BBQ in Wyandotte County. Steven: Thanks Congressman for sitting down with us. You know BBQ is important to everyone in this district. We are at Gates. How has the balance been between Congress and running for re-election? Yoder: This is my fifth time running for Congress, each one is different. I enjoy the campaign because we are out talking to people, I have been around the community. It gets me energized and with family. I have little ones I have to tuck in. Steven: You said you have family to balance? Yoder: There is a work, life balance. It is awesome but a bit of stress at the same time. Steven: You mentioned energy. Someone told me you never had coffee? Congress isn’t must see TV, it's not exciting all the time. What do you do to stay energized? Yoder: I drink some iced tea from time to time, but I don’t (drink coffee). Most people get up and go to Starbucks, that hasn’t been my thing. I may have had a sip or two in my life but I’ve never had a cup of coffee, I don’t like the taste. Steven: Everyone has a unique background, you were a delivery guy? Yoder: I grew up in Hutchinson, Kansas. I was a farm kid, wheat, soybeans, my family has done it for five generations. I had to get a job in high school. My sister worked at Pizza Hut, so I applied because that's where she worked. They hired me at 16, worked through high school. Washed dishes, cooked some pizzas, was a delivery driver and was a shift manager. When I went to KU, I worked there and on campus as well. At one point, Pizza Hut and Applebee’s. The food is nothing like this. Steven: Barbecue is, and I am from Atlanta and my parents are wondering why I gained weight in my first year here, you have to try all the places right? Yoder: In Atlanta and being here you have realized; southern BBQ is no match to BBQ here. You heard it here first folks, it is better than the south. Steven: We talked about this on our podcast . You said your district is uniquely rural, urban and suburban. It has gone blue nationally a couple times. Why do you think voters have elected you, a republican in a district that clearly may have voted for you, have voted for Hillary Clinton? Yoder: I think the cool thing about the district is people are independently minded. They don’t just follow national trends, they are educated, informed. I spent my whole life here, I went to KU, practiced law in this community, I know the people here, I worked here, raising my family here, I know what is important to them. Creating good jobs, we need higher paying jobs, make sure folks can put their kids through college, healthcare is important, being in touch with what people want in a district like this is critical. That’s why I think I keep getting elected. Steven: The President is not popular everywhere. Even as of late with tariffs, he has been unpopular in states that voted for him. Do you have to do a balancing act of when you do cozy up to the President and when you don’t? 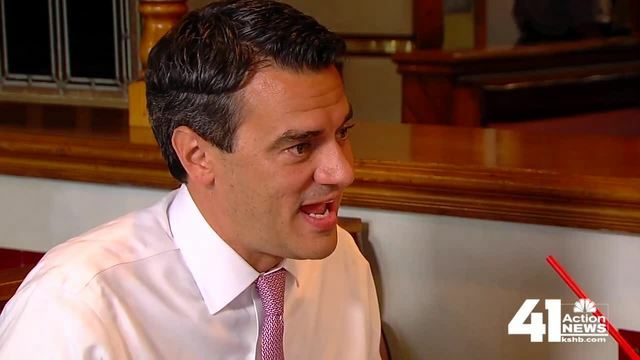 Yoder: My philosophy is whether it was President Obama or President Trump or if it would have been President Clinton, the job is to work with the president to get things done for my community. With President Obama and Biden, we worked together to get more funding for medical research, I worked to get violence against women re-authorized. The current President, we work to get taxes low, regulatory costs, cutting spending in government and investing in things that matter. But I also am able to push back on education and Betsy DeVos, we have pushed back on her. We aren’t going to cut things we are going to add to it, early childhood education. I don’t support the tariffs, I stood up when the President had child separations, I said "Stop doing that," I worked to get families reunited. With each President I can give you examples of where I stood with them and where I stood up to them based upon what they are actually doing. Steven: Take a break from politics, take a bite of your sandwich. What is your favorite BBQ item? Yoder: I gotta go with the burnt ends, it’s our local specialty. Steven: You mentioned your wife, she went to Kentucky, you went to KU - who has the better basketball program? Yoder: For the last few years we have gotten the best of them. Kansas beat UK three times in a row. Kansas has beat Kentucky, but when it really mattered they beat us and that stung a bit. My joke is my wife married me because she wanted to find a guy who knew a real basketball school and she hates that joke. I have converted her a little bit. Steven: What do you say to those who say, Kevin Yoder says one thing but when he gets to Washington he does something else? I think the most visual thing is you are buddy buddy with the president, which in your case it might not be bad. Yoder: I didn’t support the President in the primary, I voted for Marco Rubio. I do believe when we elect a president we need to work with them to get things done. When he is focused on job creation, the economy, national security, the majority of the public is with him. When he is focused on tweets, bullying or other things that I don’t like either, I don’t think the public is with him. I have told the White House that and I have responded to a number of his tweets. When he said John Lewis wasn’t a hero. John Lewis is a friend of mine, I walked over the Pettus Bridge with John Lewis, his words have changed lives forever. I am not going to spend my time trying to disrupt, I work with both sides of the aisle. Me and (Congressman Emanuel) Cleaver co-chair the civility caucus. We town hall together; We lead by example, a Republican and Democrat, a Missouri Tiger and Kansas Jayhawk can work together to get things done and that is the attitude I take to congress. There is a lot of negativity in that town. How do we get to yes, how do we get things done? My opponent comes from the resistance movement.